The original Summit House was a long, flat roofed, 1960’s office/retail building, occupying the length of the application site. The retail units were previously occupied by three retailers with vacant offices above. The office building was vacant for approximately two years and was considered a local eyesore. 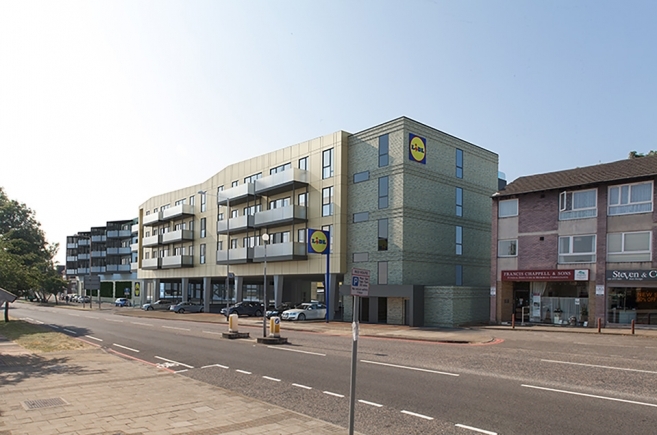 The approval was granted for a new Lidl supermarket and 54 residential units above (consisting of 1 and 2 bedroom flats and 3 bedroom apartments), car parking, cycle and refuse storage. 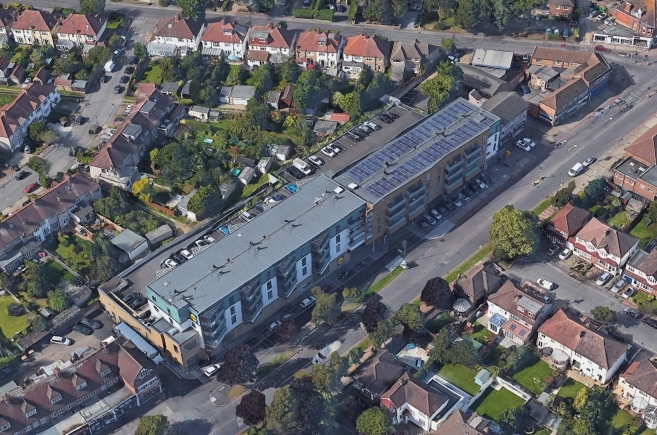 As the proposed residential units are located above a retail store and have no ground floor access, the site is more suited for smaller residential units and therefore a higher provision of 2 bed flats were proposed. The proposed housing mix was prepared following careful consideration of the local characteristics of the site and surrounding area and in response to market demand. All proposed units comply or exceed the minimum flats sizes within the London Plan Design Guide. Careful consideration was given to the layout and positioning of the proposed homes to ensure appropriate conditions of privacy, outlook and sense of openness are created whilst improving the impact upon the streetscene. The elevation form was designed to break the long street frontage into two smaller, distinct elements; one to the eastern side of the street frontage that appears as a robust, grounded element that includes the proposed Lidl store and the other to the western side which is expressed as a lighter element, raised above the car park on columns. The building is four storeys in height, which is only 3m higher than the existing roof height. A series of set backs were included on the eastern and western ends of the building to reduce the opportunity for overshadowing. 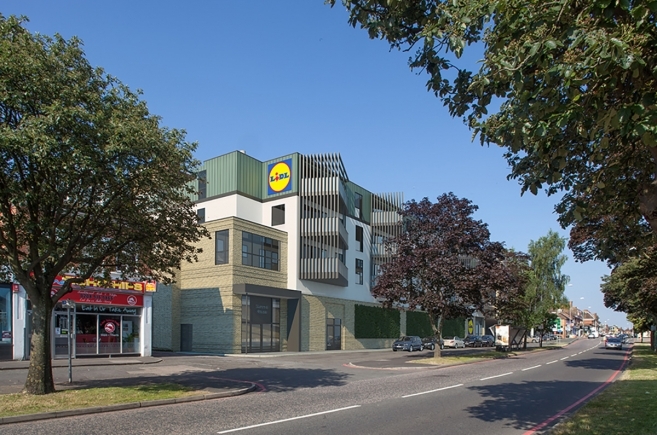 The proposals include two car parking areas which are separate for the retail and residential elements which include the provision of 45 car parking spaces for the private dwellings and 75 parking spaces for Lidl customers. The new Summit House design delivers a sustainable mixed use development on a site that was previously under utilised and offered no architectural value. The new building provides a high quality design which generates significant socio-economic and planning benefits to the local area.